Cisco 7945G IP Phone (CP-7945G) demonstrates the latest advances in VoIP telephony, including wideband audio support, backlit color display, and an integrated Gigabit Ethernet port. It addresses the needs of transaction-type workers with significant phone traffic and the needs of those working with bandwidth-intensive applications on colocated PCs. Cisco 7945G Unified IP Phone includes a large, backlit, easy-to-read color display for easy access to communication information, timesaving applications, and features such as date and time, calling party name, calling party number, digits dialed, and presence information. It also accommodates Extensible Markup Language (XML) applications that take advantage of the display. The phone provides direct access to two telephone lines (or combination of lines, speed dials, and direct access to telephony features), four interactive soft keys that guide you through call features and functions, and an intuitive four-way (plus Select key) navigation cluster. A hands-free speakerphone and handset designed for high-fidelity wideband audio are standard, as is a built-in headset connection. The Cisco 7945G Unified IP Phone is designed to grow with your organization and enhancements to your system capabilities. The dynamic feature set allows the phone to keep pace with your requirements through regular software updates. Firmware changes can be downloaded from Cisco.com. No hands-on moves and changes are required with the phone-you can simply pick up the phone and move to a new location anywhere on your network. 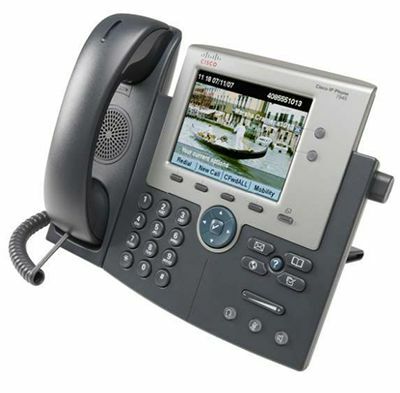 The Cisco Unified IP Phone 7945G also provides many accessibility features.